THE province of Surigao del Norte was placed under a state of calamity, following a 6.7 magnitude earthquake that struck the region over the weekend. The resolution, dated Monday, February 13, was signed by Vice Governor Arturo Carlos Egay, Jr. Under the declaration, the governor is allowed to disburse funds from the 5 percent reserved calamity fund, including the 30 percent Quick Response Fund for relief operations and rehabilitation. The Philippine Institute of Volcanology and Seismology (Phivolcs) said the quake hit Mindanao at 10:03 pm on Friday, February 10, with its epicenter, located 14 kilometers northwest of Surigao City. Several aftershocks were recorded after the earthquake but the Pacific Tsunami Warning Center said on its website that there is no tsunami threat caused by the tremor. Disaster officials have confirmed eight deaths and at least 200 people injured during the quake. 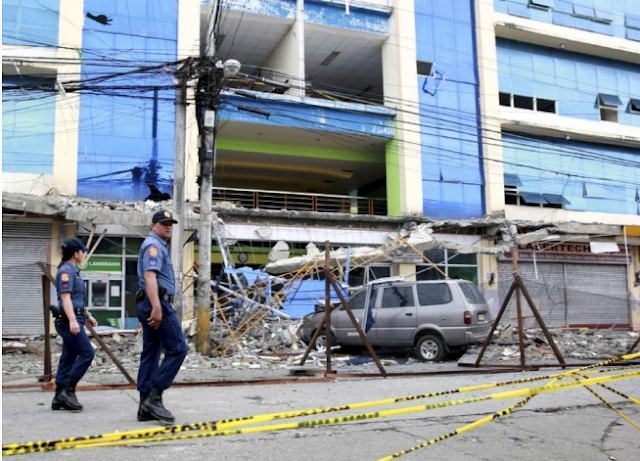 “This was the first time Surigao had suffered a quake this strong. The previous one occurred in the 1800s,” Communications Secretary Martin Andanar, who is also a native of the region, said. The government initially estimated about a total of P687 million worth of damage to houses and infrastructures caused by the tremor, including the Surigao City Airport, which will be closed for one month for repairs. On Sunday, Philippine President Rodrigo Duterte visited Surigao del Norte to inspect the damage caused by the earthquake and the authorities’ response effort. During his speech before the residents, Duterte vowed to extend financial assistance to victims of the tremor. “I will release money for you, so prioritize those who lost their lives and source of living,” Duterte said in Visayan, as quoted by CNN. According to Presidential Spokesperson Ernesto Abella, relief goods were delivered to Surigao on Sunday. “Distribution was initially hampered by an inadequate distribution system. The victims were already expecting the relief goods as early as 5 a.m., but the local government made a judgment call to wait for the President who arrived by 1 p.m.,” Abella said in a statement. The New People’s Army (NPA) also reportedly declared a “localized ceasefire” to pave the way for relief operations.